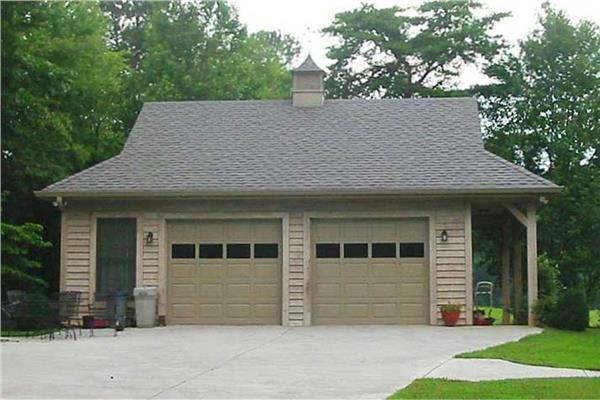 Garage plans come in many different architectural styles and sizes. From simple one car garages to two, three, or more spaces – doors or bays. Other garage plans include workshops or even a bay for sporting equipment – from golf carts to boats and canoes. Some designs include apartments on the second floor as well. Garage plans are available in an impressive array of designs and layouts, reflecting the modern versatility of this classic home addition. Long gone are the days of simply using a garage to store a car, as many homeowners make great use of this rugged additional space to create everything from home offices to weekend workshops. The real benefits of a garage come from the use of sturdy materials for the construction, most notably the use of concrete on undisturbed earth as a strong, durable flooring. The attributes of this pragmatic construction make the building ideal not only for storing vehicles but for serving as a shop for repairing a car, woodworking, or even arts projects like painting or sculpting. Garage plans can vary quite dramatically from small (about 500 square feet) to large (around 1,000-1,500 square feet) and even to huge (over 3,00 square feet). It all depends on your needs and the available space on your lot. Smaller garages are great for storing a single car or housing those holiday decorations during the off season, whereas larger designs can accommodate multiple vehicles while also giving you a dedicated space for your projects. Many homeowners also use the additional space in extra-large garages as recreation or media rooms, installing flat screen televisions, mini bars, and pool tables that may not fit within the main home. Our selection of garage plans includes stand-alone, semi-detached, and attached variants, giving you even more options for gaining access to the space from your main house.